Complete Site Redesign for William P. Griffin, Ph. D of Springfield MO. We worked with Dr. Griffin on design features yet keeping to simplicity but content-rich, classy yet readable. 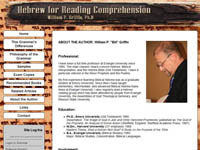 The site goal is to allow prospective professors and reviewers to view summary information about his revolutionary e-book Hebrew for Reading Comprehension e-book, and request an exam/review sample. The site design was completed in April of 2010, but will likely see upgrades in the coming months. The site was built to load fast and on older browsers, keeping in mind that many professors might be advanced in years and not up to par with technology.